Hello and welcome back to another update of Forgotten Hope. Today, we have two Allied weapons of war that should support the Americans in their defense against the attacking German armies, and an announcement about the start of a new campaign from World at War. 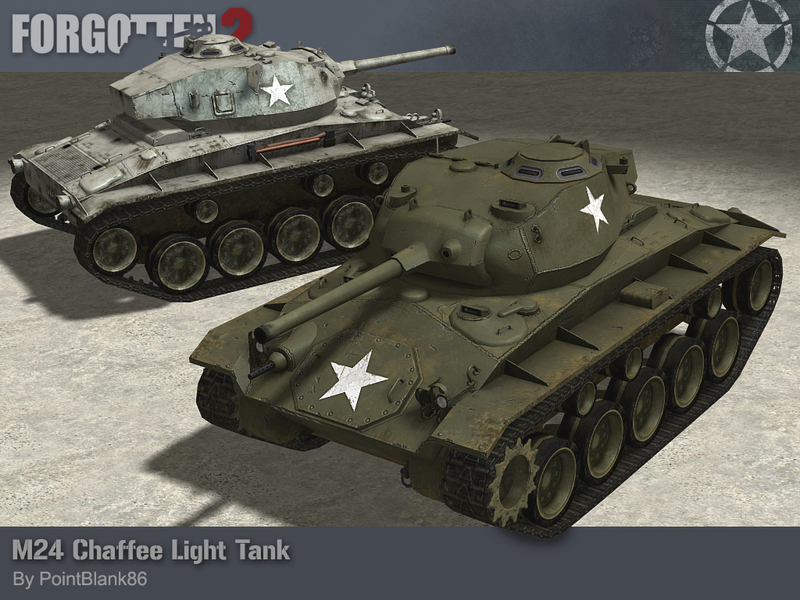 First up is the M-24 Chaffee; a brand new light tank to serve the Americans in the Ardenne! The shortcomings of the M3/M5 Stuart highlighted the need for a new scout tank. Starting in 1944, production began on the new Light Tank M24. The new vehicle featured 25mm thick armor and a new, lightweight 75mm main gun derived from the B-25H Mitchell bomber. The first thirty-four M-24s arrived in Europe in November 1944 and were send to various units throughout France. Most Chaffees entered widespread use during the Battle of the Bulge, but were slow in reaching the frontlines, and some didn't even reach their intended units until after the war. Those that did were generally happy with the 75mm gun, however the tank was still vulnerable to nearly all German anti-tank weapons. Over 4,731 Chaffees were produced from 1944 to 1945. The M-24 Chaffee was made by Pointblank86. Next up we have a new twist on an already battle-proved infantry weapon. The M1919A6 Browning Light Machine Gun! The M1919A4 medium machine gun had already served well with Allied troops throughout the Invasion of Normandy. The A6 variant was an attempt to turn the weapon into a lighter platform for Airborne troops. A wooden buttstock was added along with a lighter barrel and a bi-pod. Ironically however, the A6 was heavier than the A4 (without the tripod), but the bi-pod made it easier to carry and deploy, as the need for a man to carry the tripod was removed. The M1919a6 saw action in the later part of World War II, and extensively during the Korean War. 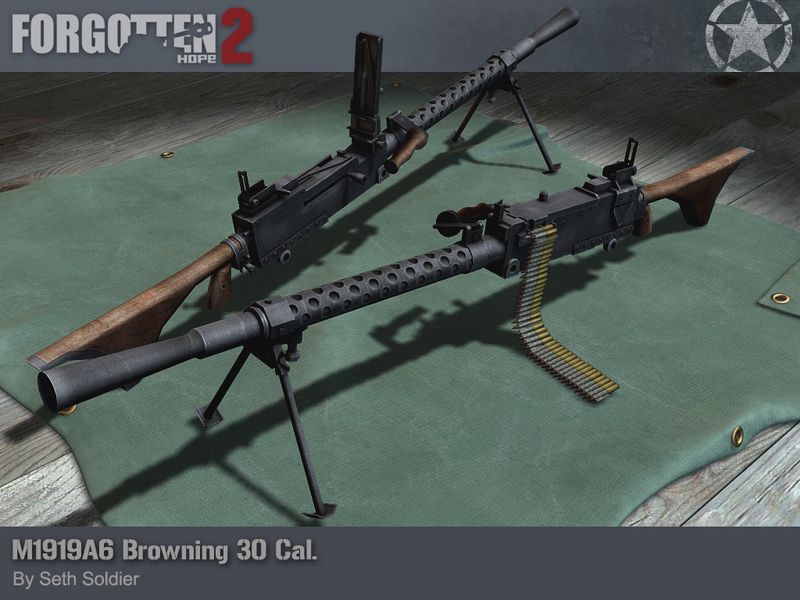 The M1919a6 was made by Seth_Soldier. Lastly, we have an announcement from the World at War Tournament. Here's what they had to say. The World at War Tournament, powered by MyInternetServices.com, has been producing the best team play on the Battlefield platform for over seven years and is proud to welcome you to our 22nd campaign. The tournament uses the Forgotten Hope 2 World War 2 mod which is being expanded with custom maps, new equipment, a new and simplified equipment selection system and deployable rally points. The Axis war machine has activated the Spainsh 63� Divisi�n Espa�ola de Voluntarios "Azul" to spearhead the assault on Europe. At the forefront of the Allied counter-attack is the 64th Welsh Division (Red Crown & Dragon) which shall fight for every inch of ground. 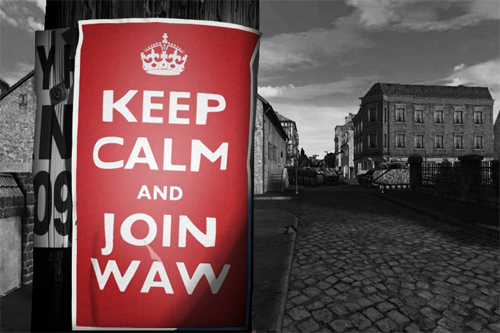 Each division is led by an officer corps of experienced and dedicated WaW players that will train you to become part of a quality fighting force and give you the skills needed to be a future officer in WaW. Face the enemy on 13 battlegrounds spanning across Europe and fight for total victory. Deployable static objects. Place barb wire, anti-tank barriers and more in real time. A simple purchase system allows your division to select and upgrade its equipment for every battle. Fly as part of dedicated air forces utilizing FH1 style nose-cams for improved visibility and fun. Hello and welcome back to another update of Forgotten Hope. Today, after a very successful release, we are coming back strong with two very recognizable vehicles in their own right. Before anything else, we would like to thank everyone for the huge success surrounding last week's release of 2.3. We have been very pleased with the feedback and the overall reception of the new update. We hope that you'll have many more enjoyable times while playing FH 2.3 until our next release! Now, onto the actual update. Patch 2.3 was the final conclusion in the series of all-Normandy patches. While we certainly aren't done for good with the lush hedgerows of France, today we have two tanks that served both the American and the German armies in the snowy fields of Belgium. Up first we have the M4A3E2 (75)W and the M4A3E2 (76)W Sherman "Jumbo" tanks. In June-July 1944, the US Army accepted a limited production run of a new variant of the M4A3 Sherman; The 75mm Sherman "Jumbo". Intended to be used to breakout from the Normandy beaches, the Jumbo had extra armor welded onto the front on sides to the point where it was thicker than that of the Tiger I. The M4A3 series of tanks was also the first to be equipped with the new horizontal volute spring suspension (HVSS) which helped with traction over soft ground like snow or mud. Despite its original intentions, the Jumbo variants of the M4A3 didn't enter combat until August 1944. However, being armed with a 75mm or a 76mm gun in the new T23-style turret, the Sherman Jumbos served with distinction through the Battle of the Bulge. 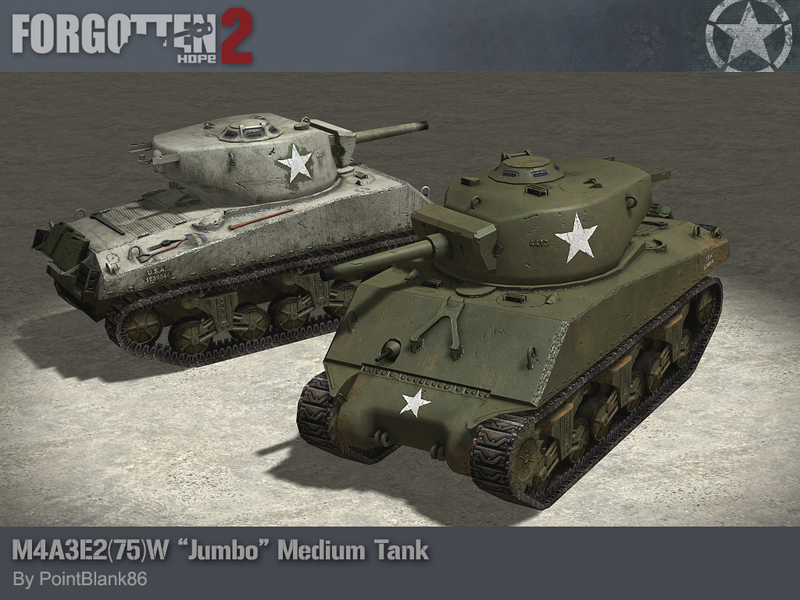 Both the M4A3E2 (75)W and the M4A3E2 (76)W Jumbo Shermans were made by Pointblank86. Next up we what could be regarded as one of the best tank destroyers of WWII due to the harmonization of the Panther chassis and the 8.8cm "88" KwK 43 gun; the German JagdPanther! 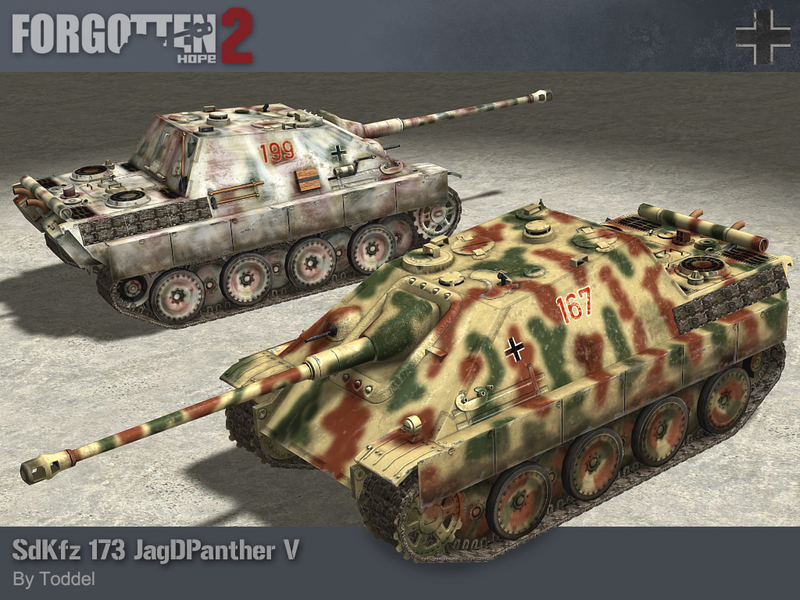 In late 1942, a heavy tank destroyer design was ordered, and after production had started in early 1944, the name JagdPanther was given to the tank, meaning "hunting panther" in German. Combining the sloped armor and chassis of the Panther tanks, along with the 88mm Tiger II main gun, and a single Mg34 machine-gun, the JagdPanther was very effective at knocking out a whole wide range of Allied tanks. Out of the 415 JagdPanthers produced, only 12 were deployed to Normandy, where the tank was first encountered. The majority saw action during the Battle of the Bulge or on the Eastern Front. The JagdPanther was made by Toddel. Hello and welcome back to another update of Forgotten Hope. Today is the day that you've all been waiting for! The release date of 2.3 is finally here! Today we have the password for the pre-release torrent files as well as mirrors for the regular, un-passworded client files. To help you through the process of installing Forgotten Hope 2.3, we've prepared some step-by-step instructions. You will need to download only the incremental patch (555.69MB) to play 2.3 if you have a clean installation of 2.26. If you have in some way modified your exsisting 2.26 installation, you will need to download and both part 1 and part 2 of the 2.3 full installer, totaling at 3.3GB. Installing custom maps doesn't count as modifying your installation! After extracting the installer just open the file and it should guide you through the rest of the installation, and then you are good to start playing! If you've downloaded the client files without the password (you will find links to these files below) then all you have to do is run the .exe file and follow the instructions to complete in installation for either the patch or the full install. On a final note, we would like to thank all the fans for their dedication and support of Forgotten Hope 2. We hope you enjoy the new patch and have some good times while playing with the new content. Also, be sure to drop by our public forums and voice your opinions on the new patch. If you have any questions about the torrent, the installer, or Forgotten Hope 2.3 in general, you can always join us on our IRC channel, Teamspeak 2 server (IP: 80.190.246.166:20019) or our public forums and will we do our best to help you out.